The Red Devils have joined arch rivals City in pursuit of the Arsenal forward, but Merson isn’t sure they should have. MANCHESTER UNITED’S ‘GAMBLE’ on Alexis Sanchez surprises Paul Merson, who feels Jose Mourinho is risking a ‘custard pie’ if the player ends up at arch-rivals Manchester City. Those at the Etihad Stadium have made most of the running in a protracted pursuit of the Arsenal forward, with Goal revealing on Friday that they still head the queue to secure his services. United, though, have made a late bid to pip their neighbours to the post, sparking a scramble for a much sought-after signature. 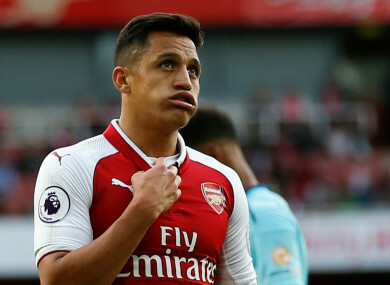 Merson understands why United have joined the chase, but feels failure to secure Sanchez could end up doing serious damage to the reputation of both the club and their manager. The former Arsenal forward told Sky Sports: “It’s a big gamble what Jose’s done with Alexis Sanchez, by going ‘I want Sanchez’. “Because if Sanchez chooses to go to Man City, that’s a real custard pie to Man United. “He surely wouldn’t just say it for the sake of saying it, there’s got to be something going on. “Man United, there’s no about it, are still the biggest football club by a million miles. But that would be a custard pie if Mourinho goes ‘I want Sanchez’, and he goes, ‘no, I’m going to go to Man City’. During Friday’s episode of Close Calls on The42, ESPN’s Mark Ogden pondered as to whether Sanchez might prove to be ‘City’s Faustino Asprilla’ – a destabilising influence not dissimilar to the great Colombian striker’s arrival when Newcastle led the Premier League by 12 points in February of 1996. Sanchez hit the 30-goal mark for the first time in his career last season, with those efforts helping to underline his value to any given cause. He has managed just eight strikes in 22 outings this season, but the uncertainty surrounding his future has provided an unwelcome distraction while he has also been shifted back to a more familiar wide attacking role following the arrival at Emirates Stadium of Alexandre Lacazette. Email “Merson: 'If Sanchez chooses to go to Man City, that’s a real custard pie to Man United'”. Feedback on “Merson: 'If Sanchez chooses to go to Man City, that’s a real custard pie to Man United'”.